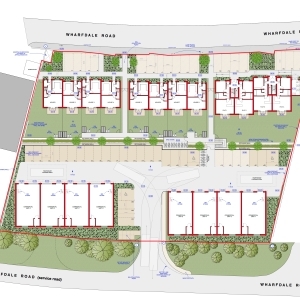 Bournemouth Borough Council: Pure Town Planning have recently secured full planning permission for a substantial mixed-use development near Bournemouth Town Centre comprising a total of 8 houses, a block of 10 flats and 8 commercial units. The application site is located just north of the A338 (Wessex Way) between the Liverpool Victoria and Bournemouth West roundabouts close to the centre of Bournemouth. The site is formally allocated as an employment site in the Local Plan (part of the site is believed to have once been used by Bournemouth Borough Council as a workshop and for storage of the Council’s deckchairs). The existing employment buildings on the site are old and inefficient and need significant investment to bring them up to modern standards and requirements. The proposal provided 8 new large commercial units which essentially maintained the existing level of employment space. The area has a mixed character with examples of residential to the north and bounded by commercial uses to the east and west. The development was therefore arranged in two distinct sections with the commercial uses on a level slab to the south, and the proposed residential units on a lower slab to the north. The scheme was designed and arranged by David James Architects who provided for a range of unit sizes in order to contribute towards the range of housing types to ensure a mixed and balanced community. The proposed traditional forms with a modern twist was considered to fit in well with the character of the area. The dwellinghouses were arranged in two terraces of four units, with each house providing three bedrooms. The ten flats all have one bedroom and were designed to be of a domestic scale befitting of the surrounding built environment. The commercial units were arranged in two terraces of four and finished in a mix of brick and cladding to complement the style of the dwellings. The application followed a pre-application process, as is advised by good practice. Following significant liaison with the appointed officer a number of changes were made to the scheme during the application process in order to arrive at a positive recommendation. As confirmed by the officer in his report: “The negotiated changes to the scheme are considered to be significant improvements over the originally submitted proposals and would not have an adverse impact on the character or appearance of the area. They would provide much needed family housing in close proximity to the centre of Bournemouth which is considerably rare and should be welcomed”. However because a petition with more than 20 signatures had been received together with a “call in” from a Ward Councillor, it meant that the application had to be determined by the Planning Committee. Our Director Matt presented the deputation to the Members, who after a relatively short debate sided with the officer’s recommendation and voted to approve the application. We understand construction is already underway and we look forward to seeing the finished development. If you have a site and are looking to maximise its development potential without incurring expensive outlay or delay, then call the Pure Town Planning team on 01202 585524 or email info@puretownplanning.co.uk.